Ms. Mona Kachhwaha has over 21 years’ of experience in banking and finance. She manages the India Financial Inclusion Fund at Caspian, an impact investment advisory firm with over US $125 million under management. Prior to joining Caspian in 2007, she worked with the Citibank in the consumer banking business. During her 13-year stint with Citi India, she was the Head of Risk for the Mortgage Business and the Business Head for Microfinance. 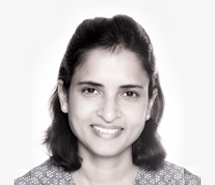 Ms. Mona Kachhwaha is an MBA from XLRI, Jamshedpur and a BA (Hons) in Mathematics from Delhi University. She completed an executive program on private equity at the Said Business School, Oxford University in 2010.